German watch manufacturer MeisterSingers crafts mechanical watches for people who aren’t interested in counting seconds, but see the bigger picture and want so stay on track. MeisterSinger builds single-hand watches – and follows a longstanding tradition in doing so. Although the movement of the long, single hour hand is hardly noticeable to the human eye, it is as relentless as the passing of time on ancient sundials. Our division and representation of time always followed the movement of the stars. Even back in the Middle Ages, tower clocks emulated astronomical models, preferring to recreate the mechanics of the heavens on Earth rather than wanting to show single minutes or even seconds. Now, the renowned watch designer is presenting its first astronomical watch – the Lunascope. The slender 40-millimeter-stainless steel case of the Pangaea family forms the ideal backdrop for the dial with its unusually large moon-phase display. The upper half of the dial features a dynamic cut in which the moon moves across a dark blue, starry background. The generous diameter of this timepiece allows a realistic depiction of even fine details of the moon’s surface – just like when you’re looking up at the full moon on a clear night. The natural impression of the Earth’s satellite corresponds to the astronomical precision with which the Lunascope presents the moon’s various phases. The moon takes 29 days, 12 hours, 44 minutes and 2.9 seconds to circumnavigate the Earth. A lot of watches round this figure down to 29.5 days, which means their movements deviate by eight hours per year and need to be corrected by one complete day every three years. 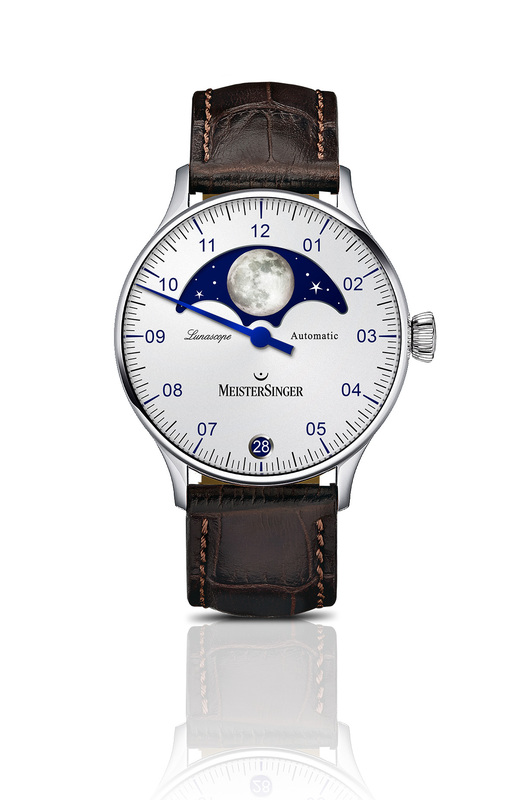 The movement specially designed for the MeisterSinger Lunascope is far more exact. Its moon-phase indicator only needs a slight adjustment after 128 years – a short period of time in astronomical terms, but a very long time in the world of watchmaking. Since the Lunascope comes with a glass back, the Swiss automatic movement ETA 2836 can be viewed. And it provides a power reserve of 38 hours. 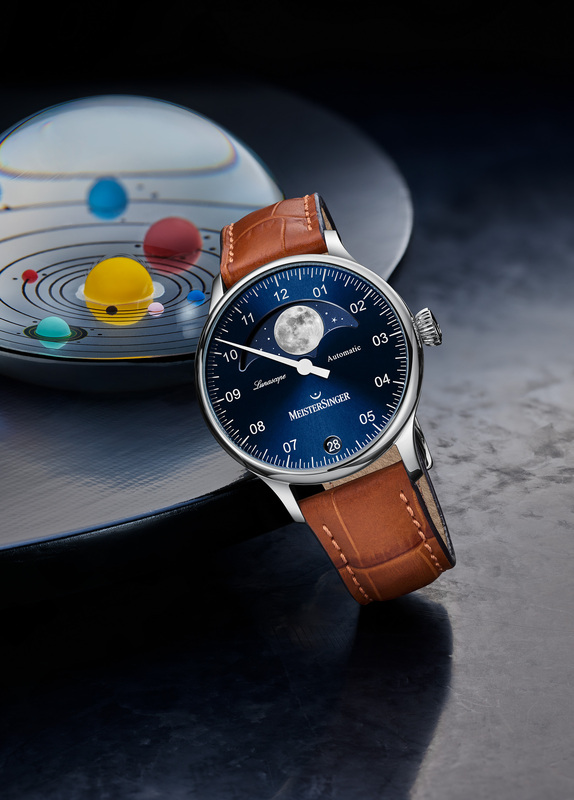 MeisterSinger offers the Lunascope in two versions: with a sunburst dial in the dark blue of the moon’s background or with a silvery opaline dial, on which the circular date window at 6 o’clock forms an optical contrast to the astronomical display. Both watches are completed by a calfskin strap.